When exploring Bavaria, Germany’s southeastern state, paying a visit to Neuschwanstein Castle is a must. The hilltop castle was designed in the 19th century by a stage painter under the orders of a “questionably” mad king. This king, Ludwig II, had a great love for his friend’s epic operas, so the castle’s interior and exterior, and surrounding landscape are the stuff of fairytales. Of course there are thousands of castles in Europe, but hopefully, this tiny snapshot of King Ludwig II’s history has made it clear that Neuschwanstein is vastly different from the rest. 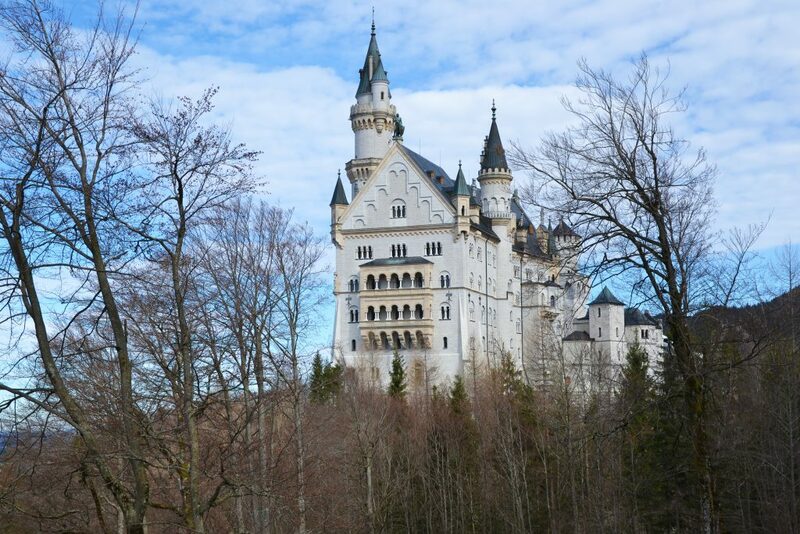 If you’re not yet convinced, you should know that Neuschwanstein inspired Disney’s Sleeping Beauty castle. It’s basically as close to a fairytale castle as we can get. Located just over 2 hours from Munich, Neuschwanstein attracts over a million visitors every year. However, knowing this did not discourage me from visiting and it shouldn’t discourage you. To make your travel planning and actual adventure as hassle-free as possible, I’ve compiled a list of what you should consider in order to make the most out of your visit to Neuschwanstein Castle. Neuschwanstein and the surrounding landscape look stunning regardless of the season. You can trust me with this claim. I’m a photo junkie and I didn’t have any worries about visiting the castle on a mild winter’s day. I knew that at this point in the season the trees wouldn’t boast any leaves, and the melted snow would’ve left a muddy mess. Despite these discouraging details, the views were still mesmerizing and the photos were outstanding… just take a look below. However, if you want to avoid massive crowds, don’t visit the castle in the summer. That’s when bulk of Neuschwanstein’s 1,000,000+ visitors go. The hiking trails can even become congested during this season. Yikes! 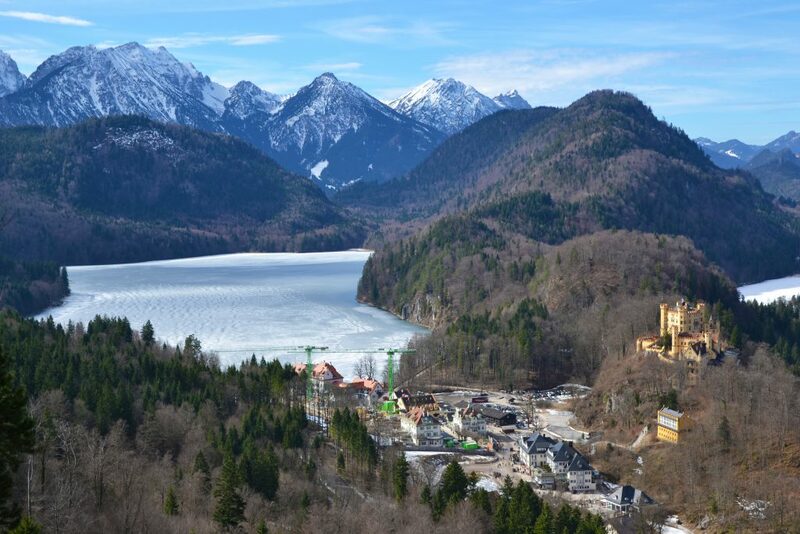 Before you reach Neuschwanstein, you need to reach Hohenschwangau. Hohenschwangau is a tiny village located between Ludwig II’s Neuschwanstein castle and Hohenschwangau castle. Tour bus, car, or train and public bus will get you to this village. 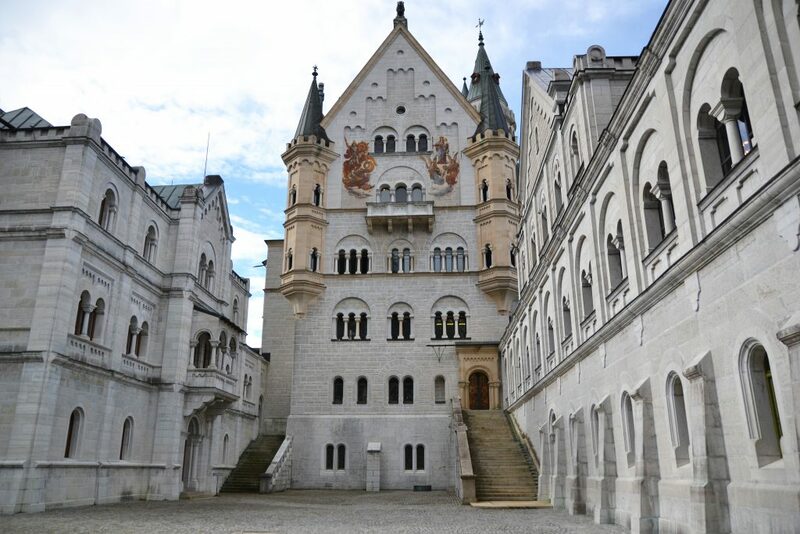 Bavaria’s website for state-owned palaces offers detailed information about getting to Hohenschwangau and the castle, and you can access it by clicking here. We chose to take the train to Füssen and the local bus to Hohenschwangau since neither of us wanted to follow the fixed itinerary of a half-day guided tour from Munich. We also didn’t want to deal with driving on unfamiliar and possibly unpredictable winter roads. Taking the train, local bus, and then making your way up to the castle may sound time-consuming, but in reality, it’s really simple, efficient, and affordable. Buses to Hohenschwangau depart right across from the Füssen train station and take less than 10 minutes to arrive in Hohenschwangau. All in all, taking the train can save you money if you purchase the Bayern Ticket. This is ideal if you’re traveling on a budget. With the Bayern Ticket, you have unlimited access to almost all trains and public transportation within Bavaria for 18 to 27 hours… for just 25 Euros. This means that if you’re traveling to Neuschwanstein from Munich, you can take the Munich public transportation, the train to Füssen, and the bus to Hohenschwangau for only 25 euros (usually, just a train ticket just from the central train station in Munich to Füssen is at least 20 Euros). If you’re feeling ambitious, you can even make your way back to Munich on the same day using that very same Bayern Ticket. And the best news is that if you’re travelling with 1 to 4 other people, it only costs an extra 6 Euros to add them to your ticket. For more information about the Bayern Ticket (and to check out the guidelines, conditions, and exemptions), click here. Please note that the 18-27 hours you can use your Bayern Ticket for depends on the day of the week. In order to visit the castle, you can purchase your ticket in-person at Ticket Centre Hohenschwangau or online. I’m not a patient person, so I’m definitely not a fan of standing in lines – especially when I’m short on time. Since the Ticket Centre tends to have lines regardless of the season (remember that over a million people visit Neuschwanstein each year), we purchased our tickets online. In fact, Bavaria’s site for state-owned palaces warns that if you choose to purchase your ticket in-person, you may run the risk of not receiving one since tour slots can be sold out on busy days. Rather than reserving our tickets through the Ticket Centre, we bought Viator’s Neuschwanstein Skip-the-Line ticket. Yes, we did pay more for the ticket than the regular admission fee. However, it saved us a lot of time and hassle. First, we were instructed to pick up our tickets from Füssen’s House L.A. – City Hostel instead of the Ticket Centre in Hohenschwangau. This was perfect for us since we had spent the night in Füssen and this hostel was only a 5-minute walk from our hotel. Once we arrived at the hostel, the hostel staff contacted their manager who arrived within another 5 minutes. Instead of waiting an hour for the next bus to Hohenschwangau, he offered to drive us there for the same fare as the bus. Once we arrived in Hohenschwangau, the hostel manager promptly converted our Viator tickets into Neuschwanstein Castle tickets and we were off – there was absolutely no “line-waiting” involved. For more information about reserving your ticket through Ticket Centre Hohenschwangau: click here. To check out Viator’s Neuschwanstein Skip-the-Line ticket: click here. 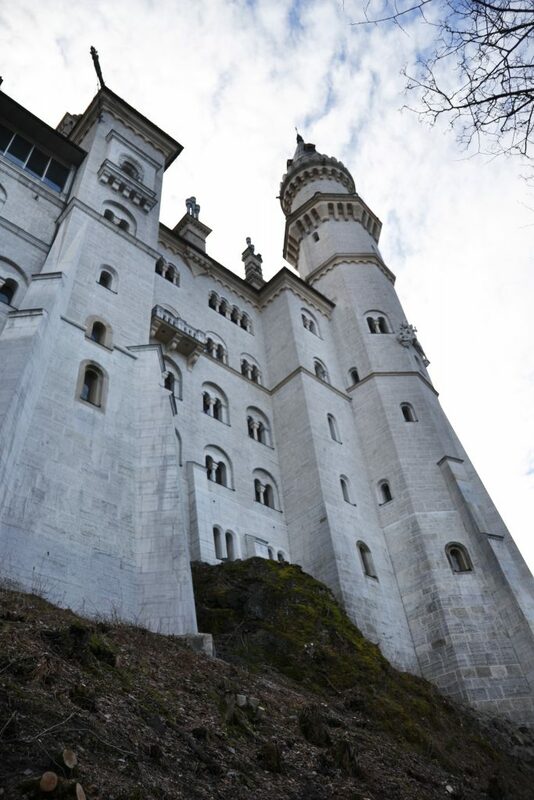 Viator offers a great variety of tours to explore Neuschwanstein castle and the surrounding area. Feel free to check them out on Viator’s site if more extensive tours of the region interest you. If you need to purchase or pick up your ticket form the Ticket Centre, it is in Hohenschwangau and not by Neuschwanstein castle. When visiting the castle, you can only take your car or public transportation as far as Hohenschwangau (located at the bottom of the hill Neuschwanstein Castle was built upon). You can choose to take a shuttle bus, horse carriage, or walk up to the castle. Since taking the carriage and bus required an additional fee and we enjoy “hiking”, we chose to walk. Your Neuschwanstein Castle Tour Ticket will have a tour time printed on it. Your ticket is only valid for your tour time, so it’s important that you make it to the castle ahead of time or on time. Give yourself at least 40 minutes to reach the castle on foot from Hohenschwangau. The trails around Neuschwanstein Castle offer some incredible views of the castle, Hohenschwangau, and the surrounding landscape. In order to make the most of your visit, I highly recommend taking an hour or two to explore them. My favourite trail was the one that took you to Marienbrücke, which is a bridge that crosses the Pollät Gorge. Not only can you snap the perfect shot of the castle from the bridge, but if you follow the trails on the other side of it, you can get an even more impressive, slightly elevated view of Neuschwanstein. Views along the path to Marienbrüke. As mentioned earlier, it takes roughly two hours to reach Hohenschwangau from Munich. It’s still an acceptable distance for a daytrip, but spending 4 hours on the road in one day may not be something we all enjoy. Fortunately, if you don’t want to, you don’t have to. The Ostallgäu district of Bavaria, where Neuschwanstein Castle is located, has so much to offer its visitors in of form of picture-perfect and colourful Alpine towns. Since you’re already so close to them when visiting the castle, you might as well explore them…and consider spending the night in one of them! 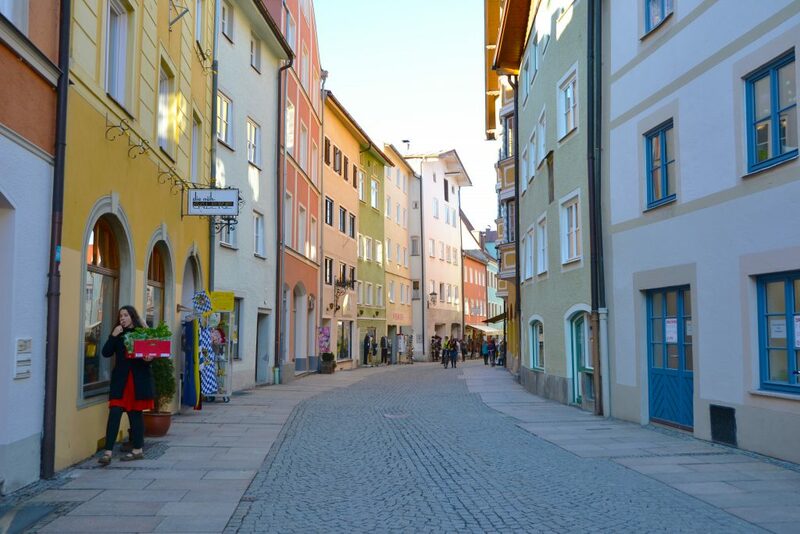 Füssen is one of these impressive little towns. 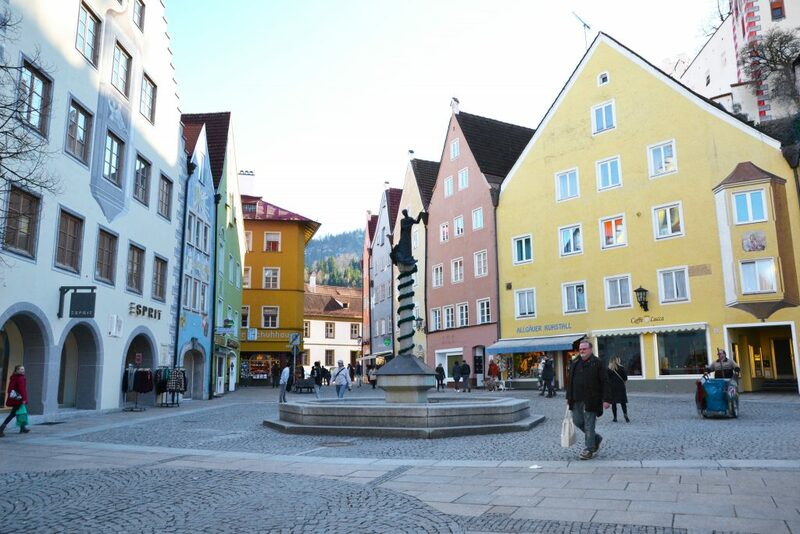 I’m recommending Füssen because it operates public buses that take you to Hohenschwangau and has a train station that will get you to (and from) Munich. 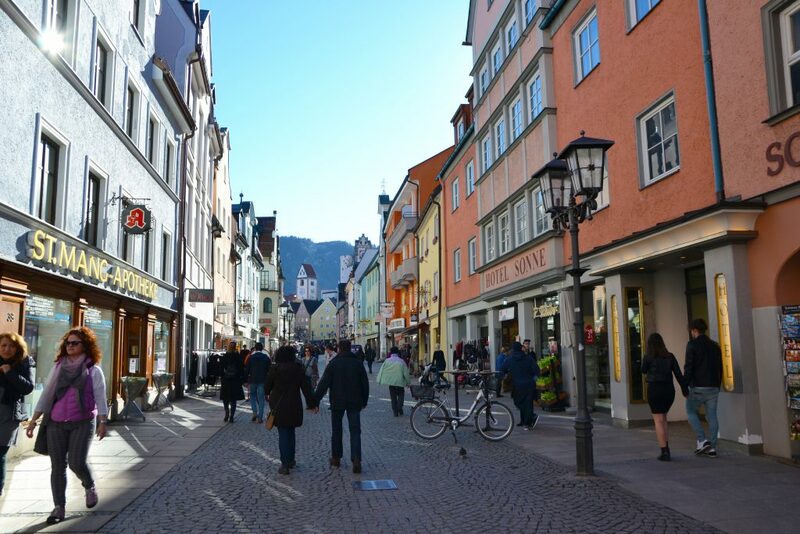 The hotels and hostels are affordable and the town itself offers visitors incredible sights and attractions, such as the Hohes Schloss Füssen and the pedestrian streets in the old town right below it. We spent the night before our Neuschwanstein visit in Füssen (we stayed at the Central City Hotel). 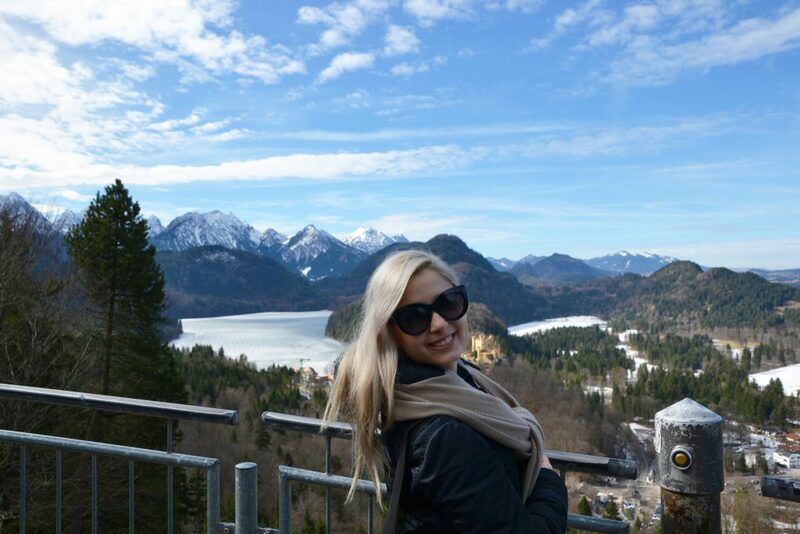 After visiting the castle the following day, we explored Füssen. 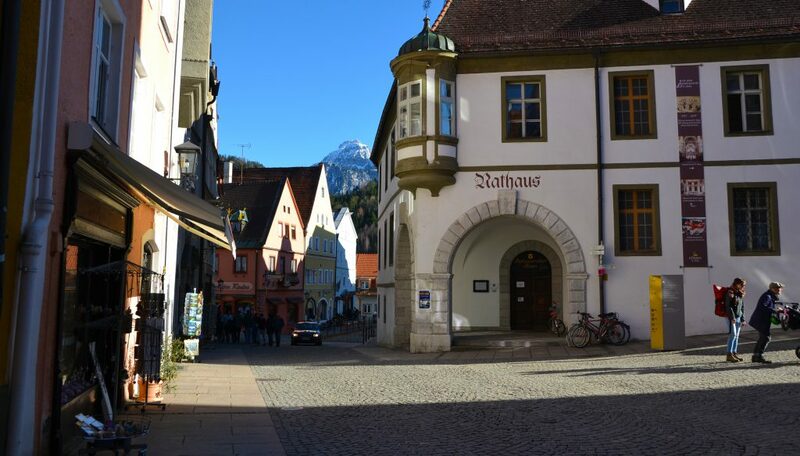 Spending the night in Füssen gave us to get more time to rest (no early morning in order to catch a train), explore the area, and slow down the pace of our Neuschwanstein experience. As an added bonus, our Bayern Ticket gave us the flexibility to choose any train we wanted to get back to Munich that afternoon – talk about a stress-free travel experience! When I was a child, my family owned a cottage 2 hours north of Toronto, Canada. Off of one of the country roads on the way there, there was a tiny restaurant owned by a German couple. In every single room of this restaurant, you could find a photo of Neuschwanstein Castle. I grew up on Disney classics, so I marveled at these photos. I promised myself that I would step foot in Neuschwanstein one day. Decades later, I did, and I am still completely in awe of the castle and surrounding landscape. Do you have any tips for visiting Neuschwanstein Castle? Feel free to share them below! Beautiful photos! Would love to visit and if I ever do I will have a comprehensible list to follow! Thank you! Thank you! I’m happy to hear that you found it useful! Oh, the Sleeping Beauty castle! I’m also enchanted by it! Thanks for all the tips, especially about Füssen. It looks like a lovely little town! Füssen really exceeded our expectations! I am planning a trip to Germany just to visit the castles. Bavaria sounds fun. Great photographs btw! There are so many more castles in Germany that I want to see. Eltz Castle is one of them! And thank you! So awesome to make a childhood dream come true! I’m based in Berlin and am also planning to visit Munich this year, and of course Neuschwanstein is on my list! So thank you for this guide 🙂 And also, I had no idea about the Bayern ticket – will come in handy for sure! Great post!! The Bayern Ticket was such a lucky discovery! I’m glad I could help! Such stunning photos. And wouldn’t you agree that it is even better in the winter with the snow? Good advice about hiking 40 minutes beforehand. I think it would have looked magical with the whole landscape covered in a nice layer of snow! Fortunately, Neuschwanstein still looked pretty stunning without it. Wonderful pictures. Definitely on my list of places to go now. What a small world! I have totally been to this castle AND the German restaurant you are talking about in cottage country Ontario. How funny is that?! That’s incredible! What a small world! They had great schnitzel. Those photos made me feel like going there right now. Thanks for the tip about the Bayern Ticket, i haven’t heard of it before and it would be perfect for me as I normally travel with my mom. We are planning about visiting this castle in our next trip to Germany! I’m glad I could help! The Bayern Ticket was a huge money-saver for us. I visited in high school, and I want to take my husband here someday! I loved everything about. The hike up is beautiful, the town is adorable and the castle is magnificent. We loved the bridge on the trails around the castle for photo taking too! Definitely a must see in Germany! I think I could spend my whole day just photographing the outside of the castle, the grounds that surround it and that colorful town! Wow! This castle is also on my bucket list. It looks so stunning. I bookmarked the post, it is so helpful. Thank you for sharing! Wow! Neuschwanstein looks even more beautiful close-up! They’ve done an incredible job maintaining it. I’d love to visit someday. I’m happy you got the opportunity to go. I want to go back too! And 2 weeks in Germany as a high school trip sounds beyond amazing! The visit is definitely worth it! And thank you!